Railpictures.ca - A.W.Mooney Photo: Back in 1972 a unique restaurant opened in downtown Orillia. “Ossawippi Express” Fine Dining. The business finally went under, citing hard times, in the spring of 2010. Eight rail cars that made up the venture were in limbo. The City of Kawartha Lakes negotiated to move the cars out, but the deal fell thru. All cars were destined to be scrapped. Fortunately in Dec 2012 and Jan 2013 four of the 8 cars were moved to Port McNicoll to be part of Skyline International Development’s venture up there. DAR Business Car “Nova Scotia” went to Heritage Centre at the Toronto John St. Roundhouse. 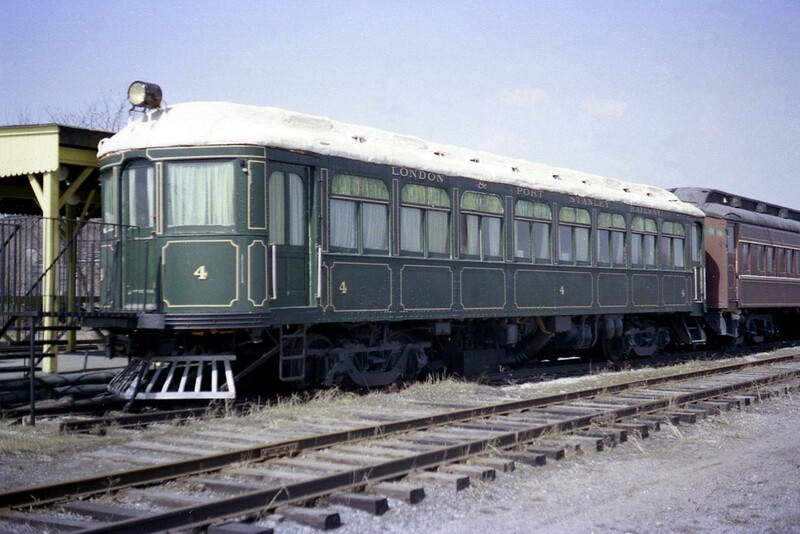 The Interurban pictured, LP&S #4, was relocated to the Halton County Radial Railway in Milton as of September 2012. Two cars from the restaurant were scrapped; CP Official car 37 and x-CP Baggage 21054. | Railpictures.ca – Canadian Railway Photography – photographie ferroviaire Canadienne. Caption: Back in 1972 a unique restaurant opened in downtown Orillia. "Ossawippi Express" Fine Dining. The business finally went under, citing hard times, in the spring of 2010. Eight rail cars that made up the venture were in limbo. The City of Kawartha Lakes negotiated to move the cars out, but the deal fell thru. All cars were destined to be scrapped. Fortunately in Dec 2012 and Jan 2013 four of the 8 cars were moved to Port McNicoll to be part of Skyline International Development's venture up there. DAR Business Car "Nova Scotia" went to Heritage Centre at the Toronto John St. Roundhouse. The Interurban pictured, LP&S #4, was relocated to the Halton County Radial Railway in Milton as of September 2012. Two cars from the restaurant were scrapped; CP Official car 37 and x-CP Baggage 21054. There was another car at Port that wasn’t in CTG (and may still be there) it was sitting well away from the two psgr cars. This MAY have been the express reefer CN 10627. Those two cars were in pretty poor condition at Port. Any idea what happened with the ones still unaccounted for? So two were scrapped that went to the Port, two were scrapped outright, one went to John St and one to Halton Radial. Only two passenger cars went to Port. 41 the Eye Car and 65 Safety Instruction car. Never used. Both scrapped 2017.